Bi-Centenary Celebrations at Sulgrave Manor. Weekend of June 7th/8th. 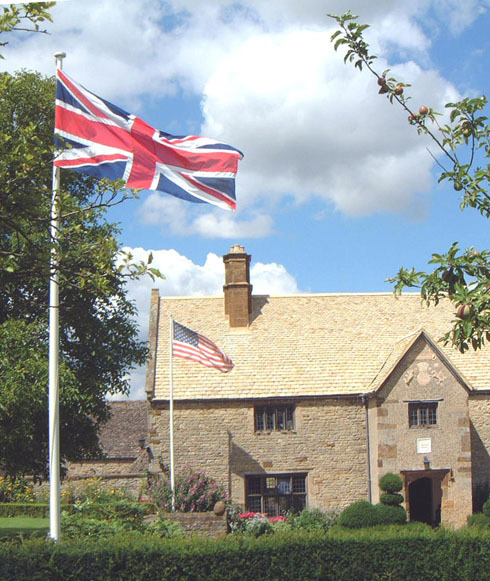 This year is the bi-centenary of the signing of the Treaty of Ghent and centenary of Sulgrave Manor’s purchase to be a symbol of the friendship between the United Kingdom and the United States. For a hundred years the Manor has been supported by the National Society of the Colonial Dames of America and on the weekend of 7th/8th June, 120 Dames and their husbands will be visiting the Manor to celebrate this event. The organisers cordially invite all residents of the village to join the Dames on either or both of these days to enjoy the various events which have been planned. Full details on the next page. The Dames will be having a picnic lunch in the Manor Grounds (or if it rains in the marquee) and it is very much hoped that as many village residents as possible will join them, either bringing their own picnics or pre-ordering one to be supplied by the official caterers. During the afternoon the Manor staff will give a short Tudor performance. At 3 o’clock the Grafton Hounds will be parading in front of the assembled multitudes. Tours of the Manor will be on-going throughout the afternoon, and some village gardens will be open to be visited. Details and timings will be advised in the April and May village newsletters and on this website. The Dames will, as always, be attending a service at St James the Less; they will then attend their biennial Dames Day luncheon at the Manor. In the evening there will be a hog-roast in the marquee, followed by a performance of Noel Coward songs, lyrics and anecdotes from his life performed by the Edinburgh Festival award winning, Cropredy based, Coal Wharf Studio. Coal Wharf have presented this production several times at the Manor and it has been extremely well received; again all residents of the village are invited. Tickets will be available from the Manor at £35 each. The Manor Trust hopes that as many villagers as possible will attend the events at some point during the weekend to celebrate the shared history of the two nations and thereby recognise the support that the Colonial Dames have given to the Manor over the last hundred years. This entry was posted on Monday, March 17th, 2014 at 4:47 pm	and is filed under News. You can follow any responses to this entry through the RSS 2.0 feed. You can leave a response, or trackback from your own site.